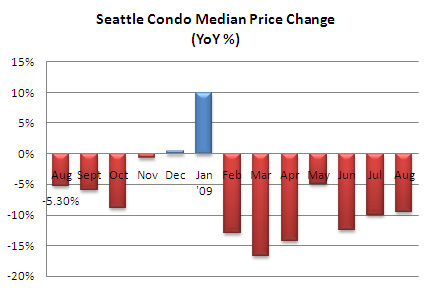 The Seattle median condo price rose modestly to $280,274 last month, up 3.8% over July. Compared to last August, it reflected a 9.6% dip. Throughout most of 2009, the year-over-year median price has been under 2008 levels, however, the gap has been steadily narrowing. 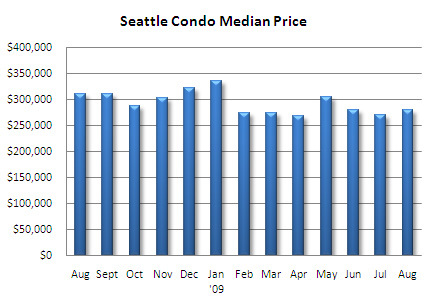 Fortunately, median prices have essentially plateaued this year (see graph below) and we haven’t seen the wide swings as we did last year. Two areas realized increases in median price last month. The downtown/Belltown area median price increased 8% over July and 11.5% over August of last year, mostly due to to closings at newer developments. 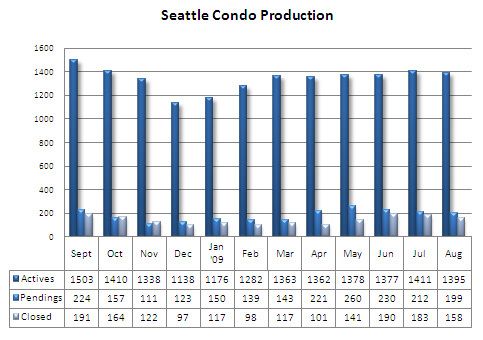 West Seattle exhibited a 10.4% one month increase and an 11.7% year-over-year increase. On the other hand, Queen Anne and NW Seattle showed the largest year-over-year decreases in median price, down 10.6% and 9.6%, respectively. The condo inventory supply dipped slightly in August, down 1.1% from July and 6.4% compared to last August according the the NWMLS. In actuality, the decrease in supply was a bit more substantial with Equinox’s conversion to apartments last month, which effectively removed 200+ units from inventory (most were not listed). 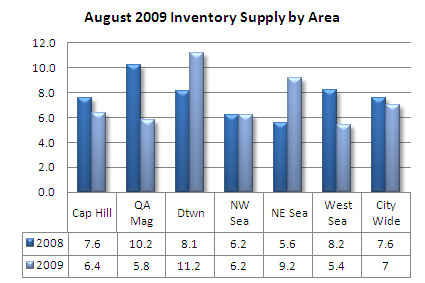 Northeast Seattle and downtown/Belltown reflected increased inventory last month, up 7.4% and 34.4%, respectively. Most of downtown’s increase was attributed to newly listed units at several new developments, while NE Seattle were predominately re-sales. Although the stats show downtown’s inventory increased 7.4%, it actually changed very little as many of those newly listed units were always available. The NWMLS stats are based on properties entered into the NWMLS database and few of the hundreds of new construction units are reflected in the NWMLS database. The NWMLS is expected to change this practice. 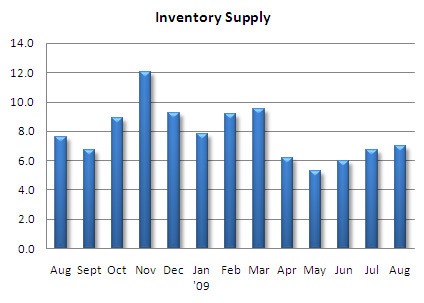 The supply rate, now at 7 months, has been trending upwards indicating fewer sales relative to inventory. This is evidenced by the drop in the number of units going under contract last month by 6.1% from July (13 properties), though it did exceed the number of pendings in August 2008 by 1.5% (3 properties). At 7 months, Seattle remains in a marginal buyer’s market. There is no doubt that condo sales this year were boosted by the first-time home buyers tax credit. In reviewing closed sales data for the past three months (June – August), condos under $350,000 accounted for 74.8% of all condo sales while those over $500,000 accounted for 10.6%. Compared to the same three-month period last year, only 64.4% of sales were under $350,000 and 14.9% were priced over $500,000. Comparing year-over-year, the number of sales under $350,000 increased 16.1% while those priced over $500,000 dropped 28.8%. Currently, the tax credit will expire on November 30th and unless it is extended or the economy improves, we may see a decline in sales. Source: NWMLS, not all statistics were compiled or published by the NWMLS. Great post! I wish it were that easy for me to compile data for my local real estate market. Unfortunately, such data is almost impossible to come by here in Medellin, Colombia! I am glad to see that real estate valuations are recovering in the United States.